Tela Beauty Organics by Philip Pelusi will be featured this weekend in the prestigious DISCOVER BEAUTY line-up, which will include hidden gems from across the globe, hot brands that are the “brand to watch”. The Tela Beauty Organic Brand has been hand-picked, and invited by the Discover Beauty team, to feature at Cosmoprof North America – the leading global beauty trend-setter organization, to showcase and unveil itself as one of the most innovative and best emerging Brands of today. Tela Beauty Organics represents innovation and product performance – developing luxury haircare while being driven by science + organics. And, patent pending technology to produce supernatural, hi-tech formulas. Each unique Tela formula is empowered with Tela’s proprietary 35 certified organic powerhouse ingredient blend for luxurious hair - think cashmere and silk. Philip Pelusi has designed Tela's innovative, patent pending technology to deliver powerhouse ingredients that cause profound healthy hair results and benefits. 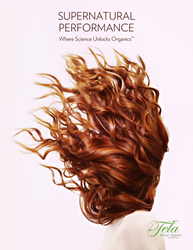 Philip Pelusi’s breakthrough lipid hydration technology combined with Tela’s 35 Certified Organic Blend creates the most tangible environment for hair to become and remain healthy. This innovative, patent pending technology is the nerve center of our combined approach with science and unmatched organic performance in each Tela formula. In addition to featuring its full hair care line of 24 innovative haircare product options, The Brand will closely feature its most recent product launches coming from Spring/Summer 2016: Guardian Angel, Solar Hair Serum and Frizz Buster, for Anytime Frizz Control, and Anytime Shine! Guardian Angel, Solar Hair Serum shields hair from daily stress, such as environmental damage, and color fade during solar exposure. Unique to its formula, is a proprietary Tela Beauty Organic Solar Protection Blend/UV Absorber Complex – an advanced, optimally effective cocktail of color fade inhibitors such as organic Quinoa, Sunflower, Jamaican Black Castor Oil, and Sasha Inchi. Frizz Buster, an anti-frizz dry texture spray allows for anytime frizz control, and anytime shine. Its specialty formula blend comprised of certified organic seed oils: Quinoa, Baobob, Sunflower, and Lavender Seed make it the perfect on-the-go compliment to keeping hair beautiful and shiney throughout the day for every lifestyle. Both new formulas contain over 35 certified organics plus Hydro Pelusi Ceramide Complex, signature to Tela Beauty organics by Philip Pelusi. Philip Pelusi is the first to combine this kind of synergy of science with organic performance. And, to achieve radical formulas of 35 Certified Organics in each Tela product – never been done before. © 2016 PP Branding, LLC. All Rights Reserved. Tela is Vegan, Color Safe and free of gluten, parabens, formaldehyde, BHT, and sulfates.